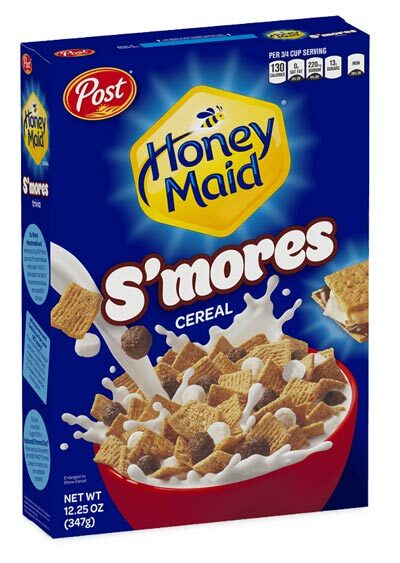 CORN MEAL, SUGAR, WHOLE GRAIN WHEAT, MARSHMALLOWS (SUGAR, MODIFIED CORNSTARCH, CORN SYRUP, DEXTROSE, GELATIN, ARTIFICIAL FLAVOR, NATURAL FLAVOR), MOLASSES, PARTIALLY HYDROGENATED SOYBEAN OIL, FRUCTOSE, CORN FLOUR, MODIFIED CORN STARCH, CONTAINS 2% OR LESS OF: CORN SYRUP, HONEY, SALT, BAKING SODA, CORN BRAN, COCOA POWDER (PROCESSED WITH ALKALI), COCONUT OIL AND/OR CANOLA OIL AND/OR SOYBEAN OIL, SOY LECITHIN, DEXTROSE, CARAMEL COLOR, TRISODIUM PHOSPHATE, NATURAL & ARTIFICIAL FLAVOR. BHT (TO PRESERVE FRESHNESS). VITAMIN B1 (THIAMIN MONONITRATE), VITAMIN B2 (RIBOFLAVIN), NIACIN (NIACINAMIDE), VITAMIN B6 (PYRIDOXINE HYDROCHLORIDE), FOLIC ACID, VITAMIN B12, VITAMIN A PALMITATE, VITAMIN C (SODIUM ASCORBATE), VITAMIN D, REDUCED IRON, ZINC (ZINC OXIDE), CALCIUM CARBONATE.